In the beginning we should practise a High Horse Stance. This is similar to many other Zhan Zhuang站椿. 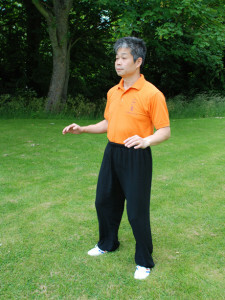 The feet should be shoulder width apart, the back should be straight so the Baihui百會 and Huiyin會陰, Yong Quan涌泉 points are in a vertical line. The knees should be slightly bent, the eyes are open and the mouth is closed. We should look forwards but should not focus on anything. Instead we should just be aware of our surroundings, but should not let anything bother you. The forearms should be held horizontal so your palms face down to the floor, this also means the Qi can release out. As the Horse Stance will create a lot of Qi some of this will release out through the Laogong points. The Laogong point is one of the main acupuncture points which easily releases Qi and can be used for healing as well. Our fingers are also relaxed but open and they will also release some Qi as well. Each finger is connected to an internal organ. So it is important to open the palms, keep the fingers relaxed but straight and breath through the nose all the time. If any part of the body is tense or stiff we can move a little so it feels better, but otherwise we should just stand and relax.